Two seperate large open air decks above the ocean provide places to sit or lay back, dine, enjoy morning coffee and barbecue. Bluefin Cottage sits on a perch above the ocean providing breathtaking ocean sites and sounds from every angle. Views to the south are of ocean as far as the eye can see Views to the north are slightly different with long stretches of beach along with the jagged edges of rock formations lining the beach. Again, beauty beyond words. The living room in our house provides comfortable seating for relaxing and enjoying the views outside and conversing with family and friends. We love these two leather easy chair. Stare at the ocean, read a book and as you can see we`ve left the chess board out. If you`re with family or friends and would like some alone time go upstairs to the den and rock and read or watch TV from the couch. The kitchen will see to you every need. It`s well stocked with pots, pans, utensils and cookware. What`s more, it`s easy to serve out on the back deck. If you care to dine indoors the kitchen table is surrounded by ceiling to floor sliding glass doors. You`ll be able to see how many windows our home has that face the ocean and provide ample natural light in the final picture provided. Perhaps you caught a glimpse of our gas fireplace in the dining area. This one is in the hall along with the one in the dining area helps with heat on a cool night or day. Once there you`ll be above the dining room and kitchen. You can see the sky lights and high ceilings that provide a sense of maximum space. You`ll never feel closed in here. The master bedroom has a nice firm queen sized mattress with plenty of closets and dresser space. Wake to the sounds of the ocean right outside your room. Step out through the slider and say good morning to the world. The second bedroom provides another fine mattress in double size. Leave the curtains open and enjoy the night sky and ocean sounds as you drift off to sleep or awaken in the morning. We love to read and this small library may provide something that intrigues you. The bathrooms are modern and clean with plenty of electric outlets and light. ... and a full size washer and dryer is at your beck and call, just adjacent to the kitchen. Our decks are popular for gathering and spending time. Whether you`re alone with a book or with a good size group...there is plenty of room. And the second deck is a great place for the kids to hang out when they seek to get away from the adults. Here again, the front deck is one of my favorite spots in the house, you`ll enjoy the ocean breeze and salt in the air. From gulls to sailboats you`ll always remember the moments you`ve spent here.. Natural light and ocean views from every angle of our home are what makes this place so special. We hope that like us, you`ll leave all your troubles behind and enjoy the healing powers of the ocean. We always feel rejuvenated after spending time here. THE HOUSE: A recently renovated cottage with weathered shingles and fresh coastal feel inside. This single-story home is a true gem for those who love the sea. Main Floor - Master bedroom with one queen bed, second bedroom with one double bed. Two full bathrooms with tub and shower combo. Enter through the den and step down into the kitchen and dining areas, both lined with tall windows overlooking the deck and ocean. One bathroom is off of the living room and the second bathroom is closest to the two bedrooms down a short hallway. Guests will enjoy access to several sandy beaches, nature trails through marshes, tidal sand flats, and miles of gorgeous rocks. 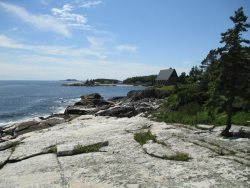 Don't forget the spectacular oceanfront views of Cuckolds Lighthouse and the Seguin Island Lights! Start your mornings with beautiful sunrises and end them with breathtaking sunsets. Located in the small private community of Indian Point in Georgetown, island living in a relaxed setting is yours at Bluefin cottage. The team members have always been very friendly and helpful and quickly responded to any questions. Excellent staff. The view was spectacular, it was quiet, private and relaxing. It has been a pleasure. The staff were helpful in many ways. We very much appreciated their caring attitude. We have come back many times. It's always traumatic to leave!! The team was very helpful prior to our arrival, answering all our questions and making sure we had all the details we needed prior to our arrival. We did have an issue with finding the property and had to call the office. The call was answered promptly and we were able to locate the property and get in without further issue. The staff is great! The cottage we stayed at was fantastic. It was very clean, had fantastic views and all ammenities we needed were already there such as coffee filters, toilet paper, paper towels. The kitchen had all the necessary cookware we needed to prepare meals. We were very pleased with the service from Cottage Connection. The maintenance man, Richard Start was very customer friendly and helpful. The staff responding to our planning emails were also very responsive and helpful, Lucy & Melba. We were expecting to have internet connection to check on activities in the area but that did not happen. Melba and Rich explained the difficulty with the local provider. We are strongly considering booking for the same week next year, same cottage. Thank you for this opportunity to provide feedback. The best part of our vacation was the spectacular view from the cottage looking over the Atlantic with the waves crashing on the coast right below our feet, the three lighthouses we could see from the large windows at the cottage, the fog and the changes in tides. The view is spectacular! "Boy, we really appreciated being able to ship our boxes ahead of time, that was great. We LOVE the place. Happy that the water tasted better this year. The landscaping to the area where cars parked seems to alleviate the soggy situation from prior stays". Peace, quiet, beautiful surroundings!! Great location, lots of light, comfortable. A 4-NIGHT MINIMUM IS REQUIRED FOR NON-PEAK SEASON RENTALS. Cottage address, driving directions and lock box combination will be e-mailed to the guest TWO WEEKS prior to arrival. Swimming Area Rating 5/5: Very easy water access at nearby sandy/pebble beach, great for all ages!